Good morning Lemmings and just what, may I ask, has happened to Silly Season? I ask because a) like all the shell-shocked looking MP’s who’ve been violently ejected from their mid-summer torpor, I shouldn’t be here right now and b) I love Silly Season and feel somewhat slighted that I haven’t been able to spend the summer reading about cats with bus passes or spurious moral panics. To be fair though, it’s not like I didn’t have fair warning: As soon as the phone hacking scandal broke, I knew that it was going to take a shark at least fifty Dimbleby’s long (my new favourite unit of measurement) to be sighted off Cornwall before normal service resumed but I must say that I wasn’t banking on society collapsing in quite the spectacular fashion that it has. Still, here we are now so we might as well try and make the best of it. Welcome Lemmings, to a very rare event: Emergency Question Time. Ok, so the backdrop to this episode is pretty clear, what with the youth of today trying to affect political change through the mass sacking of JD Sports (a novel tactic, but one not without its merits) and as a result, Dimbleby has been defrosted from his traditional Recess-CryoSleep in order to provide the middle classes with a socially acceptable alternative to the Jeremy Kyle Show in their time of need. So, with who’s company do we share this impromptu return to the abyss with? 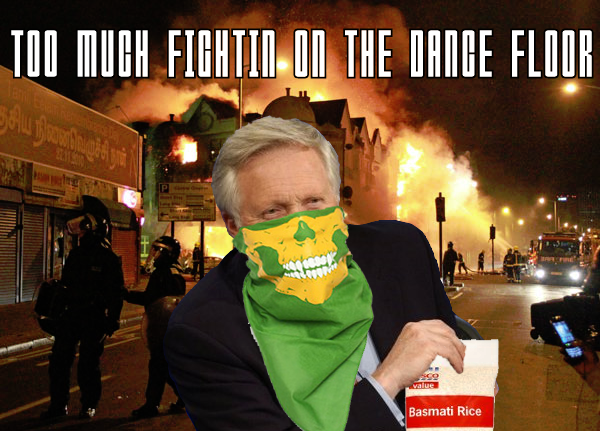 Well, first up we have former Deputy Prime Minister and God’s Gift to Photoshop (see Fig. 1), John Prescott. When I first heard he was going to be on the show I was actually quite pleased as he had a very good turn of form when it came to the phone hacking scandal and a busy summer for him may also mean that he won’t have the time to appear in any more car insurance ads (for which the nation would be grateful), However, what I totally forgot was that while he can be very effective when whoever happens to be holding his leash singles out a target and hollers “Sick ‘em, boy!” and is frankly brilliant at soaking up punishment that would break less hardy souls, he is terrible at situation that have even the slightest hint of nuance. Not only that, but he also has an uncanny knack for reminding everyone exactly why they fell out of love with New Labour, not something that’s especially useful when the Labour party is frantically trying to rebrand itself. In practice, these traits boiled down to a pretty straight forward affair, mainly characterised by sentences starting with “You and your mates” whenever Fraser Nelson was in the frame and much hot-under-the-collary at all other times. To be fair, his opening shots about police numbers did find their mark but any territory gained was quickly squandered by him flying off the handle at the slightest provocation and his insistence on making the argument personal. That approach is fine when there’s a clear villain to assail (like in the case of phone hacking), but in a situation as fluid and dynamic as the one we have before us now, it just looks ropey. Worse still, his insistence on casting the whole shebang as some epic left-vs-right affair gave both Nelson and Davis ample opportunity to dredge through Labour’s record and paint them as the baddies. Now, I’m not saying that Labour don’t have a certain level of culpability when it comes to the events of the past week as the kids who we’ve seen cutting a merry swathe of carnage through our cities grew up on their watch. However, Prescott’s approach had the effect of making it easy for the other side, easy to the extent that they didn’t really have to do any legwork and could sit back while Prezzer dug his own hole for them. Oh, and demanding that the police be armed with “plastic guns” rather than ‘plastic bullets’ doesn’t really help things much either, but there we go. “Yes, I grew up on one” came the reply and I awaited eagerly for the pained expression of a plan gone wrong to pass across her face. But wait! What’s this? She’s not even broken her stride and is instead ploughing on anyway, oblivious to the sound of her credibility vaporising! Truth be told, I didn’t know who to admire more: Davies for timely deployment of his trump card or the audience member for her sublime ability to turn a blind eye to an inconvenient reality. Anyhoo, minutiae aside, Davis played what could have been tricky hand rather well last night, stopping short of going balls-out ‘string ‘em all up’ whilst still sounding like a man you’d rather not mess with. I imagine there must have been a few sighs of relief in Tory HQ as it was a real gamble for them not send on a frontbencher and one that Dimbers did his best to make some hay from. However, deploying Davis proved to be a winning stratagem and his ability to temper his firm stance with a certain level of pragmatism carried the day for them. Not by much, but enough that they ended the show largely out of harms way. All of which brings us to the Yellow Team and their chosen man of the hour, Brian Paddick. On paper, Paddick should be a winning politician as he seems to know what he’s talking about, has an interesting background and is not inarticulate. However, despite these natural advantages he’s never really cut the mustard for me and after watching last night’s show I think I’ve figured out why: He’s too needy. Now, I’m not saying needy in the sense that he came on with a teddy and some warm milk but there’s something about his delivery which is grasping and belies an urgent need for him to believe that he’s being taken seriously. Take for example where he was trying to make the point that the you can’t compare these riots to the G20 demo. It’s a good point and one that he hammered away on for ages, but for some reason the way he said it drowned out the meaning. About five minutes later, David Davis strolls past, makes exactly the same point and gets a whole bunch of claps for efforts. Immediately alert to this, Paddick then desperately tries to climb back on to his own bandwagon for fear that Davis might twock it outright and resorts to desperately reminding everyone it was originally his point. In short, it wasn’t entirely edifying. So yes, there’s something about Paddick that just doesn’t add up and I can’t help feeling he has a rather large capacity to sabotage himself. That’s not to say that anything he said was particularly bad, it’s just that I couldn’t get past the way he said it. Right, that’s the politicos done, on to the civilians who are this week represented by Fraser Nelson, Camila Batmanghelidjh (who will now be referred to as ‘Batman’ as I don’t have the time to keep typing out her name… Seriously, it’s more like a Windows Activation Code than a name) and John Sentamu. Starting with Nelson, I think it’s fair to say that he’s the sanest of the Oddly Similar Right-Wing Scots (as represented by himself, Douglas Murray and Niall Ferguson) who are forever haunting Question Time and he had himself a pretty good show. Granted, Prescott did most of the heavy lifting for him and Davis provided covering fire but in general he came across fairly well. As for Batman, well I have a feeling she pulled her punches last night and in all honesty, I think that was probably for the best. As was expected, she did try to fight the rioters corner to certain degree and made sure that the deeper causes got a good airing, but she had the sense to see that nerves were just a little too frayed for a full on round of devils advocate and went about her business quietly. That was a good call as while I think she’s largely right, saying the right things at the wrong time can get you in a whole heap of trouble. All of which leaves us with the crowd and to be honest, they were the most interesting part of a show that never really found its feet. Predictably, the audience contained the obligatory blowhards from both extremes of the political spectrum (like the man who demanded all rioters have their personal property confiscated and the woman who dismissed the whole thing as a government orchestrated stitch up) but for the most part they were just confused, angry and unsure who to blame. As a result, the show itself seemed to lurch around, seemingly unable to hold its focus whilst people struggled to articulate things that can’t yet be articulated. In that sense, it was a pretty good depiction of the feeling that pervades the nation at present and sets the stage for what is going to be a frantic period in British politics. Everywhere you look, something menacing seems to be developing and I have a feeling that the events of the last week are just a taste of what is yet to come. In short Lemmings, I want my Silly Season back.